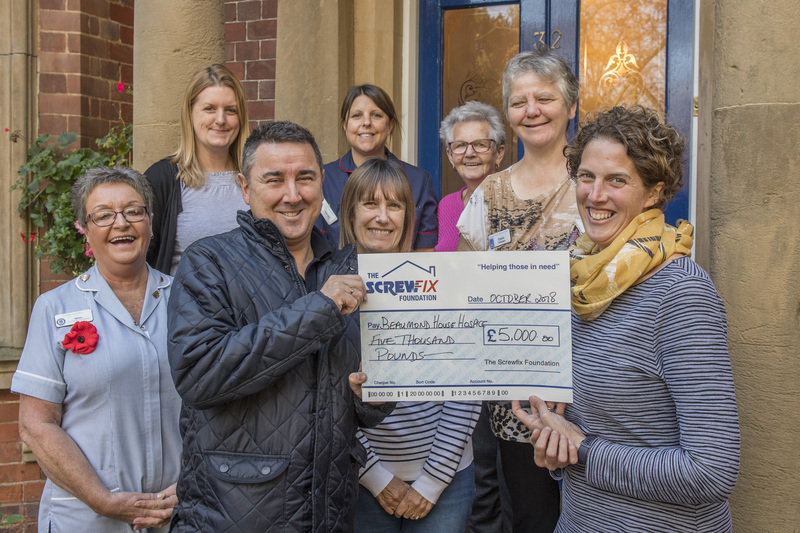 As the charitable arm of the UK’s leading multi-channel supplier of trade tools, accessories and materials, The Screwfix Foundation provides funding to local charities and not for profit organisations to support repair projects and improve facilities. Since May 2013, Screwfix customers have been rounding up their online purchases with Pennies in support of the Screwfix Foundation, giving their digital change to support hundreds of local causes and charities. An extraordinary £1.2million has been raised so far, from almost 8,000,000 individual micro-donations, benefitting charities including Brendoncare, Beaumond House Community Hospice and Lowlands Farm RDA. Brendoncare is a charity dedicated to improving the quality of life for older people through a number of services, including friendship and wellbeing clubs that give people opportunities for social interaction and a place to meet new friends. The charity contacted the Screwfix Foundation when one of their centres in Gosport, Hampshire, was in need of new heating facilities. The £5,000 they received helped cover the cost of new heaters, ensuring elderly people who had stopped attending the clubs due to the bitter temperature were able to return and enjoy their favourite social activities once again. Based in Newark, Beaumond House Community Hospice provides palliative care to over 500 patients with life limiting or terminal illnesses and offers support to the patients’ families. The hospice is the hub of the charity but being an old Victorian building, it needs continual up-keep. In 2017, the charity planned to refurbish the building to offer their patients better facilities in a fresh environment but needed funding to make it all happen. Thanks to the Screwfix Foundation, the Beaumond House received enough money to improve patient accessibility and ensure the building met the latest fire safety regulations – as well as giving all of the doors a fresh coat of paint. The level of support and particularly the swiftness in response to our application has been wonderful, to receive this grant has reminded us all how genuinely supportive local organisations are. This pleasant, light and contemporary environment will offer the best possible quality of life where patients can feel at home. Lowlands Farm RDA in Shrewley, Warwick, provides a riding group for disabled people in the local community; giving adults and children new opportunities with both physical and emotional benefits. Horse riding encourages people to engage in sports and education, build friendships and learn valuable life skills. The charity owns a mechanical horse that helps riders gain confidence and vital core strength before moving on to real horses. Their Screwfix Foundation grant paid for a hoist to help riders who had previously found it impossible to mount the mechanical horse independently, allowing Lowlands to keep delivering their services to a wider range of clients, and provide the best possible experience. Hundreds of charities need funding and support for maintenance and building up-keep – and your Pennies donations play a huge role ensuring these causes get the help they deserve. On average just five days of Pennies donations is enough to fund one of these vital projects, helping charities making a huge difference to the communities they serve – and the Screwfix Foundation has supported over 900 such projects since 2013. Thank you for every single donation – and remember the next time you’re grabbing supplies at Screwfix.com, you can round-up your purchase and help another charity in need of a revamp.